Do you enter a gym and feel intimidated by all those weight machines, dumbbells, chin up bars, ropes bolted to the ceiling, and people who seem to know what they’re doing? If you said yes, you are not alone. My first few times in the gym, I wandered around inconspicuously watching others do their stuff. As a newbie, I felt super self-conscious about my form. Was I doing this tricep kickback correctly? Was I moving too fast through my routine? What size weights should I use? How the heck does this machine work? All of these questions kept me from fully concentrating on my weight training routine, and left me frustrated with my gym experience. So, what to do? Well, my solution was to first work on a basic ‘be fearless’ in the gym routine at home. After watching myself in the mirror in my basement makeshift gym, practicing my basic 10 moves, I’d be ready to look like I belonged in the gym. For those of you who want to practice before getting to the gym, here are the 10 moves that saved me embarrassment and got me going to the gym regularly. These are basic moves that will serve you well any time you need to get a quick workout since they cover the major muscle groups from shoulders to toes. You can add more muscle-specific moves to this repertoire when you have time, or when you feel comfortable trying some new exercises. You can also continue to challenge yourself with these same moves by increasing the weight you lift, adding more repetitions, or performing the exercises on a stability ball. Before you look at the moves, note that the weight you should be using depends on what you aim to accomplish. Generally, if you want to build strength, use heavier weights and do fewer repetitions (6 or less). 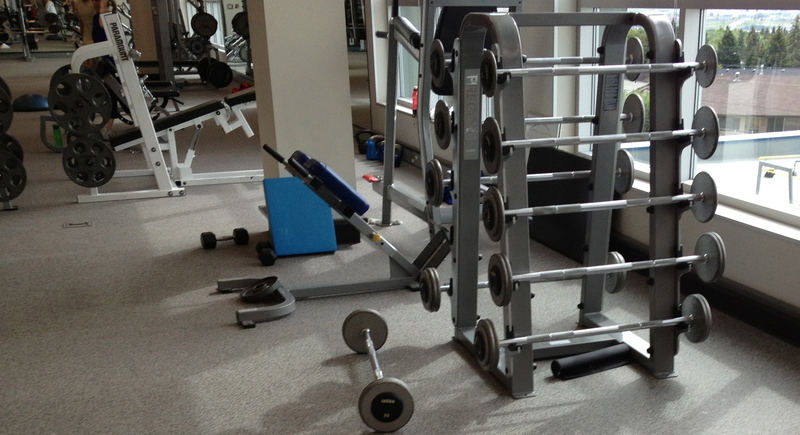 If you want to build endurance, use lighter weights and do more repetitions (12 or more). The size of the weight and the repetitions depend on your individual case. The idea is that the weight should be big enough that on your last repetition you couldn’t squeeze in one more! If this is your first time, test out the weight you think you could lift and adjust as you learn more about your abilities. Combine 2 exercises into one! Start with chest flys and then re-adjust your position to go into chest presses. You can use a bench or stability ball for these exercises. If the stability ball is too difficult for you and you don’t have a bench, try using a coffee table with a pillow on top or an ottoman to rest your back. Watch your forward knee when bending into the squat to keep it from extending beyond your toes. Widen your stance so that you are bending with your back leg, keeping your back straight while moving down. Be sure to keep your back straight and ab muscles engaged to stabilize your core. Focus on using your arms and lat muscles. This is one of my favorite exercises because I can feel a deep stretch in my hamstrings with every repetition. It’s a ‘must do’ for every runner! 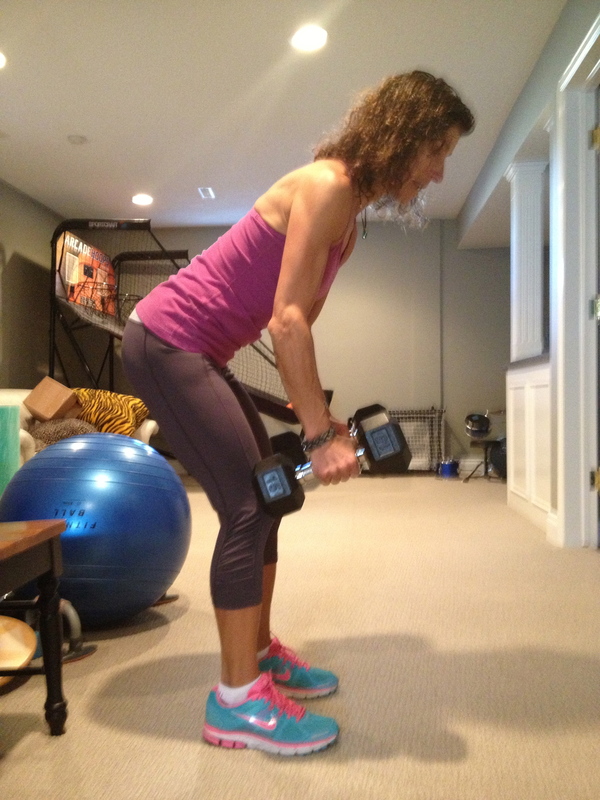 Although we’re showing you the “alternating” version of the shoulder press, it is such a versatile exercise. You can do it standing, sitting on a bench or stability ball; you can press both shoulders at once, or each shoulder separately for the requisite repetitions. Below we’ve shown you the reverse lunge. Alternate with a forward lunge and voila, you have the Forward and Reverse Lunge! Keep your back straight and your abs contracted as you do these kickbacks. Focus on your triceps keeping the upper part of your arm straight as you move your forearm back. Below is a video of the Calf Raise on a Step. 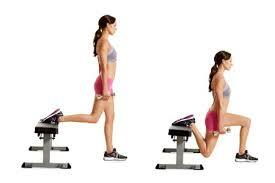 To create the combo, add Heel Dips by reversing the motion of the calf raise. Push down on the heel instead of raising up on the forefoot. These curls are done standing and with dumbbells. There are tons of other versions so once you feel comfortable with this type of curl, venture out with ‘hammer’ curls or seated curls or ones using barbells. For side crunches, lie sideways on the stability ball with feet staggered parallel and propped against a wall. Use crossed arms or place hands behind head, arms up and elbows out. Crunch up to your side until you feel a stretch in the obliques, and then move back to starting position. See Fitness.com for an animated example of this move. Bring along your iPod and pump the music to turbocharge your workout. Once you get into your practiced routine, you’ll forget all about the people around you doing their own thing. The gym will become your natural habitat! This entry was posted in Weekly Blogs and tagged beginner workouts, feeling comfortable at the gym, fitness, fitness center, gym, strength training, weight routine, weight training. Bookmark the permalink.